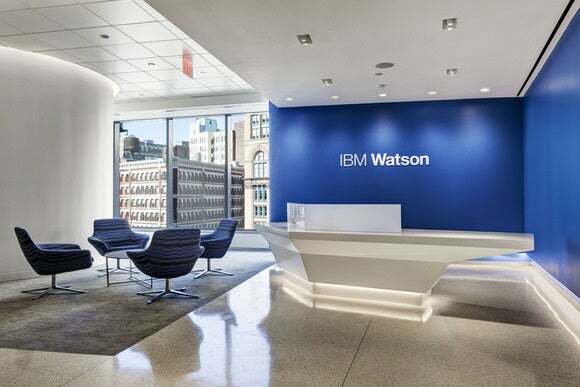 The new Watson Trend app puts IBM's machine-learning, natural-language-processing, big-data-crunching platform to work for you to help you find information on products of interest. Unfortunately, the 'insights' it provides are mostly common sense. Question: Which new iOS app combines cognitive computing and smart shopping? Sorry. I just couldn't resist an homage to "Jeopardy!," to kick off the review of a new app from the artificial brain that beat the pants off that gameshow's contestants in 2011. The app, IBM Watson Trend, aims to "help shoppers understand what is trending and why," by putting super-computer Watson's sophisticated combination of natural language and machine learning to work, to help you shop smart. It's kind of like asking Einstein to pick up your dry cleaning. Watson analyzes social networks, blogs, forums, and other online content every day, focusing on what people say about the purchases they make, or plan to make. Watson groups conversations into trends and topics, and each trend receives a score between 0 and 100. 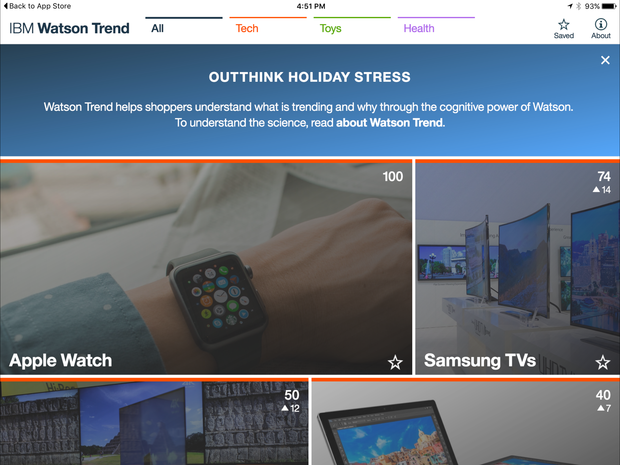 The IBM Watson Trend iOS app (and website) give you a quick read on what's trending in the categories of Tech, Toys, and Health. The information is (slightly) helpful in figuring out if you should buy those Star Wars Legos now for your kids (you should, according to the app) or if a Samsung TV is a better choice than Sony (it is, if popularity and buzz are any indication of quality). However, much of the information in the app seems like common sense, and it does not offer enough information (pricing and availability trends, for instance) to truly help you make informed consumer decisions. 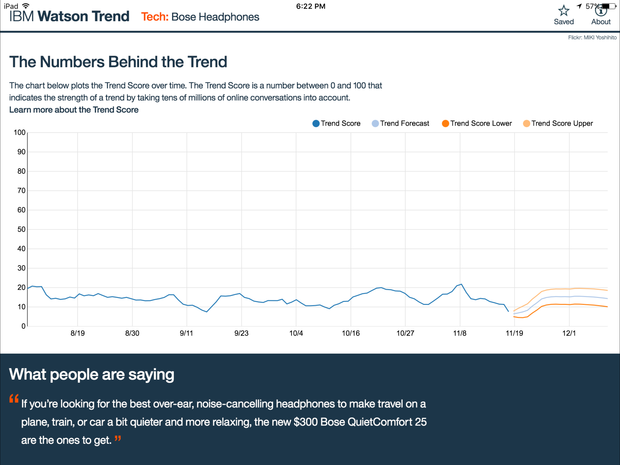 The app also provides paragraph summaries to explain products' trend scores. From the Apple Watch summary: "Since the release of Apple Watch, discussions have been mostly very positive, with few detractors. In general, people love the aesthetic appeal of the Apple Watch as well as app notifications, although some folks pine for a more classic round design." Watson says battery life is a frequently cited concern and that "many people are also expecting an Apple Watch 2 to hit shelves by the Summer of 2016 and are waiting on the sidelines until all the 'bugs' are worked out of version 1." None of that sounds like rocket science. Still, it's interesting that Apple's iPhone 6s has a super-low trend score (3), and Sennheiser's headphones have a higher score (13) than Bose (8). Also potentially helpful are the overall scores of TV manufacturers: Samsung is tops (74), followed by Sony (50), LG (31), and Vizio (20). Ultimately, the IBM Watson Trend app seems a bit gimmicky. It's OK for a quick look at what's trending. However, I recommend checking Consumer Reports for in-depth ratings and reviews (the magazine offers a nice, streamlined ratings app for Android and iOS) and using free browser price-alert tools such as CamelCamelCamel and TGI Black Friday, which is also available for Android and iOS.